I remember as a small child having an early fascination with shade charts and I grew up having the opportunity to try out a selection of painting materials from an early age on as my mother was a professional artist. 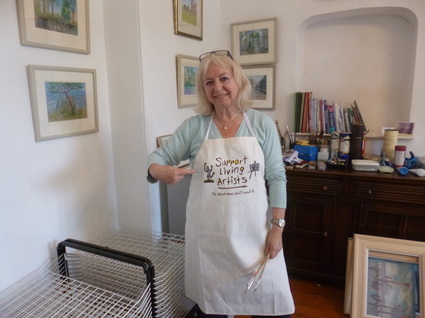 I paint in a variety of mediums, mainly in oils, pastels, oil pastels, and gouache, and trained in intaglio and relief printing at the Oxford Cooperative of Printmakers and at the Dove workshops in Somerset. In the late 1960s/70s I exhibited in a St Ives gallery but then only painted intermittently until the 90s when I made up for lost time, and have been exhibiting in London and the provinces ever since . In the 1980s I ran my own gallery specialising in 18thC and 19thC Watercolours, and have worked for a gallery selling contemporary artists so have experienced the art world from many angles. Primarily concerned with colour and the expression of reflected light, I find early morning light and the fading light of evening particularly attractive and strive to capture the magic of these fleeting moments. I have also taken a strong interest in printing, etching in particular, and endeavours to pass on my enthusiasm for printing techniques. Much of my work reflects my love of Italy, in particular south of Rome and of course, the artists paradise, Venice. I moved to Suffolk in 2014 havng been a regular visitor to East Anglia since 1979 and have always been fascinated by the sea shore, by the quiet and turbulent times of winter, and the vibrancy brought by holiday makers in high season, kite flying, colourful windbreaks and crabbing competitions. See below for list of past exhibitions. I also worked as a garden designer in the Thames Valley for several years and wrote for gardening magazines as a freelance contributor. I also lectured extensively on various aspects of gardening through the RHS Speakers list and ran my own courses, both through colleges ( Henley on Thames King James College and Ludlow College) and on my own premises over the years. though it's more ephemeral with the passing of time...and of course you need more patience to get a result. Paintings range from £250 for smaller works in pastel, gouache or watercolour to £2500 for larger oils, inc. frame. Unframed fine art prints (etchings, collagraphs, etc ) from £65.